Oscars, Golden Globes and BAFTAs are all very well, but for the animation industry The Annies are where it's at. ASIFA-Hollywood's annual event awards excellence in every aspect of the industry, not only the expected Best Feature and Best Director, but also in the lesser appreciated areas such as storyboarding, editing and production design. The nominations have now been announced for The 44th Annie Awards. This year's pack are lead by Disney's Zootopia (11 nominations) and LAIKA's Kubo and The Two Strings (10 nominations). Disney's other release of the year was not too far behind, with seven nominations bagged by Moana. Also faring well was Michael Dudok de Wit and Studio Ghibli's The Red Turtle, scoring 5 nominations. Surprisingly though, Pixar's Finding Dory only got 3 nominations, which is unusually modest by that Studio's standards. 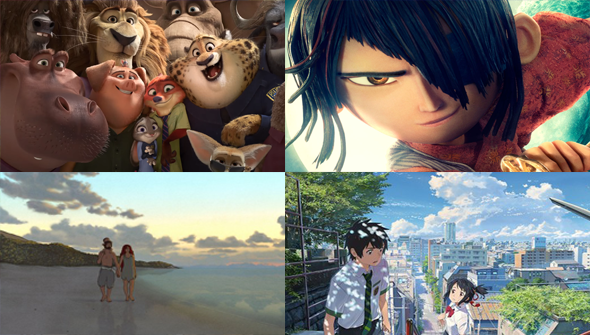 In the all-important Best Feature category Zootopia, Kubo, Moana and Finding Dory are joined by Kung Fu Panda 3. Last year the Annies introduced the Best Animated Feature (Independent) category, designed to make sure that films outside the major studios get a shot at recognition. In this category the nominees are The Red Turtle, Your Name, My Life As A Zucchini (aka My Life As A Courgette), Miss Hokusai and Long Way North. In the TV arena, several series scored multiple nominations including Gravity Falls, BoJack Horseman, Bob's Burgers and Puffin Rock. In the juried categories there is a very welcome Winsor McCay Award (for career contribution) for Ghost In The Shell director Mamoru Oshii. The full list of nominations can be seen below. The ceremony will take place on February 4th 2017.